Asus Zenfone 2 Deluxe was launched earlier this month with high-end hardware specs and a beautiful polygonal material design. Along with the Zenfone 2 Deluxe Asus launched Zenfone Selfie, Zenfone 2 Laser and Zenfone Max, in their Zenfone lineup. 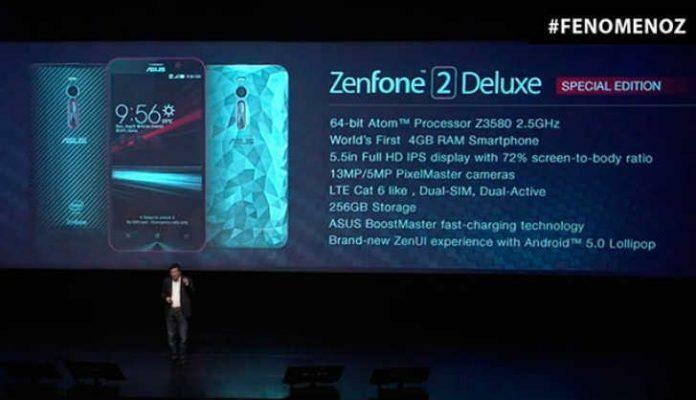 Now, Asus has come up with something too amazing, Asus Zenfone 2 Deluxe Special Edition. though the name sounds a little awkward, but the main feature of the Zenfone Deluxze Special Edition is nothing but a whooping 256GB of storage, that’s the size of an SSD we get in our laptop. And that’s not all, Asus didn’t remove the microSD slot in the Zenfone 2 Deluxe Special Edition. Just they kept everything same as the original Zenfone 2 Deluxe. If we loook at the specs sheet, everything is same as Zenfone 2 Deluxe and nothing extra has been added to Zenfone 2 Deluxe Special Edition apart from a mammoth storage of 256GB, along with the option of expanding it to further 128GB, so the storage sums upto 256GB+128GB=384GB, which is quite huge. We had seen this type of option on Saygus V Squared which has around 400GB of memory on-board. But the specs are same, The phone is powered by an Intel Atom Z3580 SoC clocked at 2.5GHz, x86 CPU with eight cores and a PowerVR G6430 GPU, the multitasking is flawless with 4GB of RAM and the screen is the same 5.5-inch with a resolution of 1080 x 1920 and Gorilla Glass 3 protection. The phone has a 13MP Pixelmaster camera on the back and a 5MP snapper on the front. A non-removable 3000mAh keeps the phone running. Just like its siblings, the phone has Dual SIM support, Cat.6 LTE and the patented Asus Boostmaster fast charging technology. It runs Android Lollipop out of the box with Zen UI on top and the limited edition even comes bundled with an exclusive version of Asphalt 8 pre-installed. The Zenfone 2 Deluxe Special Edition should be available in Brazil as of next month, but the pricing is still unknown. However, we will try to get the latest updates about the availability and price of this new Zenfone 2 Deluxe Special Edition. Do follow us on Facebook, to get all our updates on the move and if you don’t need to buy a phone with a mammoth storage, you can surely go for the Zenfone 2 Deluxe.